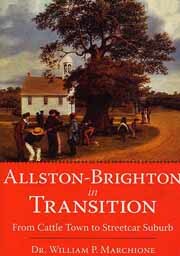 Allston-Brighton has a fascinating and unique past, a history so varied, so filled with twists and turns as to constitute a microcosm of our national experience. From its founding in the seventeenth century, when it was known as Little Cambridge, to its contemporary incarnation as a vibrant Boston neighborhood, Allston-Brighton has remained a spirited community through generations of change. John Eliot established his first Praying Indian village, Nonantum, here in the late 1600s; the Winships Brighton Cattle Market prospered from 1776 through the nineteenth century, meriting several visits from both vagrants and notables, including Nathaniel Hawthorne; and the Beacon Trotting Park provided entertainment in the late 1800s. Along the Charles, through Aberdeen, at the market and on the first electric streetcars, Dr. William P. Marchione provides a journey through the stories of Allston-Brighton's past.